Nearly three quarters of a century after his death, Hitler’s shadow continues to fall across Europe. Any dissent from any modern orthodoxy, no matter how silly, soon meets with the argumentum ad Hitlerum, to the effect that something or other is the beginning of the slippery slope to Auschwitz. Guilt by association is now the highest form of refutation—other than outright abuse, of course. There was a good example of this in the Observer newspaper last Sunday. 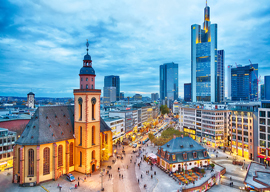 An article titled “A dubious history in the remaking?” recounted, among other things, the reconstruction of part of Frankfurt am Main exactly as it was before its destruction in the war. Frankfurt was beautiful before its destruction, as were many German cities. Germany, in fact, had one of the greatest urban heritages in the world, whose destruction no civilized person can fail to lament. The attempt to recapture some small part of it is therefore to be welcomed, albeit that however accurately the destroyed original is copied, only the passage of time will lend to the replica the charm of immemorial usage. The fact is, however, that no period of time will ever be sufficient to lend charm to what the locals call Mainhattan, the tower blocks of modern Frankfurt, which might as well be in Bangkok, Dubai, or Omaha, Nebraska, as in Germany. The article managed to smear the attempt at restoration by making it sound almost like a neo-Nazi project. The underlying argument, by implication, was as follows: Hitler and Nazism being the teleological end of German history, the crescendo to which all previous German history was inevitably leading, any fondness for anything German pre-1945 is at least a subliminal expression of Nazi sympathies. Much better, then, to stick with Mainhattan, which is beyond all political suspicion. If a German city has nothing whatever German about it, who can suspect it of bad politics? “An added attraction of many reconstruction projects [in Germany],” says the author of the article, quoting a German professor, “is that the damage being repaired was inflicted by Allied bombing, which reinforces the far-right narrative that Nazi Germany was as much a victim as a perpetrator of war crimes.” I have no special insight into the mentality of the German far-right, but surely the main impulse behind the reconstruction is an understanding of the beauty of what has been lost and the ugliness of what has been gained. My mother was a refugee from Nazi Germany, but I am all for the restoration of whatever can be salvaged in Germany because I prefer beauty to ugliness wherever it might be. The author later states in his article that “the defence of the political neutrality of architecture is wearing thin.” This really is a bit rich. The modernism and so-called international style that is the blight of Germany (and of almost everywhere else where it has been tried, which is almost everywhere in the world), and which the author of the article appears to think is apolitical, was hardly without its intellectual, ideological, and political foundations. And what hideous intellectual, ideological, and political foundations they were! The great figures of modernism—great, that is, in the scope and degree of their baleful influence, not great in artistic or aesthetic merit—were from the first totalitarian in spirit. They were toadies to the rich and bullies to the poor; they were communists and fascists (not in the merely metaphorical sense, either), and by a mixture of ardent self-promotion, bureaucratic scheming, and intellectual terrorism managed to gain virtual control of the world’s schools of architecture. Just try saying in a French architectural school what is perfectly obvious, that Le Corbusier was not a genius except in self-advertisement, that his fascist ideas were repugnant, that he regarded humans in his cities much as we all regard bedbugs in beds, that during the Occupation he suggested deporting millions of people from Paris because he thought they had no business to be there, that his designs were incompetent, and that his constructions were instinct with and the very embodiment of his odious ideas, and see how far you get up the academic ladder! (How, incidentally, were the world’s most beautiful cities and buildings erected without the aid of architectural schools?) Anyone interested in the ideological foundations, as well as effects, of architectural modernism should read James Stevens Curl’s recently published Making Dystopia: The Strange Rise and Survival of Architectural Barbarism (Oxford), a magisterial and to me unanswerable account of one of the greatest aesthetic disasters to have befallen Europe in all its history. A single modernist building in a townscape is like a dead mouse in a bowl of soup, that is to say you cannot very well ignore it however splendid its surroundings may otherwise be. Ah, you might protest, we have moved on from Mies van der Rohe et al., and so we have. (By the way, Professor Curl is very amusing on the opportunistic evolution of Mies van der Rohe’s name, as well as his equally opportunistic passage from being pro-Nazi to purely careerist refugee from Nazism.) Nonetheless two things need to be said about this supposed moving on from modernism to postmodernism and other isms: first that the damage, reparable only by demolition on a vast and inconceivable scale, has been done, and second that change is not by itself necessarily for the better. The capacity of eminent architects to spend vast sums of money to build aesthetic monstrosities fit to make Vitruvius weep is illustrated by the Whitney Museum in New York and the Philharmonie in Paris, the latter in particular of truly astonishing hideousness, that would have been almost comical had it not absorbed and wasted so much money, in the process becoming for many generations of the future as pleasing an aesthetic experience as a foreign body in the eye. The mystery is how and why the patrons, those who choose the designs, stand for it. The key, I suppose, is to be found in Hans Christian Andersen—the Emperor’s New Clothes. The patrons are afraid to be thought by the architects not to understand: an accusation that Le Corbusier leveled decades ago at all those who did not approve of his plans to destroy old cities and cover the world with an ocean of raw concrete and a forest of almost identical towers. In other words, it is intellectual and moral cowardice that makes the world go round.